Swank made her film debut in a minor role in Buffy the Vampire Slayer, before making her breakout role in the fourth installment of The Karate Kid franchise, The Next Karate Kid in 1994. On television, she was part of the main cast in the eighth season of the drama series Beverly Hills 90210 as single mother Carly Reynolds from 1997 to 1998. Swank garnered critical acclaim for her portrayal of Brandon Teena in the 1999 biographical film Boys Don’t Cry, which earned her the Academy Award for Best Actress and the Golden Globe Award for Best Actress in a Motion Picture Drama. She starred in Clint Eastwood‘s 2004 sports drama film Million Dollar Baby as struggling-waitress-turned-boxer Maggie Fitzgerald, which won her a second Academy Award and Golden Globe Award for Best Actress. She has also starred in films such as The Gift (2000), Insomnia (2002), Iron Jawed Angels (2004), Red Dust (2004) The Reaping (2007), P.S. I Love You (2007), Freedom Writers (2007), and The Homesman (2014). Swank was born in Lincoln, Nebraska. Her mother, Judy Kay (ne Clough), was a secretary and dancer, and her father, Stephen Michael Swank, was a Chief Master Sergeant in the Oregon Air National Guard and later a traveling salesman. She has a brother Daniel, who is eight years her senior. Many of Swank’s family members are from Ringgold County, Iowa. Her maternal grandmother, Frances Martha Clough (ne Dominguez), was born in El Centro, California, of Mexican descent. Swank’s paternal grandmother was born in England; her ancestry also includes German, other English, Swiss-German, Scottish, Scots-Irish, Welsh, and Dutch. The surname “Swank”, originally “Schwenk”, is of German origin. After living in Spokane, Washington, Swank’s family moved to a trailer park near Lake Samish in Bellingham, Washington, when Swank was six. She attended Happy Valley Elementary School, Fairhaven Middle School, then Sehome High School in Bellingham until she was 16. She also competed in the Junior Olympics and the Washington state championships in swimming, and she ranked fifth in the state in all-around gymnastics. Swank made her first appearance on stage when she was nine years old, starring in The Jungle Book. The firing from Beverly Hills, 90210 freed her to audition for the role of Brandon Teena in Boys Don’t Cry. To prepare for the role, Swank lived as a man for a month and reduced her body fat to seven percent. Many critics hailed her work as the best female performance of 1999 and her work ultimately won her the Golden Globe Award and Academy Award for Best Actress. Swank had earned only $75 per day for her work on the film, culminating in a total of $3,000. Her earnings were so low that she had not even earned enough to qualify for health insurance. In 2006, Swank signed a three-year contract with Guerlain to be the face of the women’s fragrance Insolence. She received a star on the Hollywood Walk of Fame in the motion picture category on January 8, 2007, and was the 2,325th star presented. In 2007, Swank starred in Freedom Writers, about a real-life teacher, Erin Gruwell. Many reviews of her performance were positive, with one critic noting that she “brings credibility” to the role, and another stating that her performance reaches a “singular lack of artifice, stripping herself back to the bare essentials”. Swank next starred in the horror film The Reaping (2007), as a debunker of religious phenomena. Swank convinced the producers to move the film’s setting from New England to the Deep South, and the film was filmed in Baton Rouge, Louisiana when Hurricane Katrina struck. The same year, she also appeared in the romantic drama P.S. I Love You with Gerard Butler. 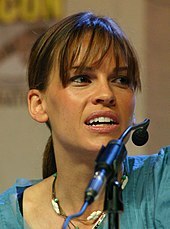 Swank portrayed the pioneering aviator Amelia Earhart in the 2009 biopic Amelia, which she also co-executive produced through 2S Films, a production company she established with producer Molly Smith. In 2012, Swank’s audiobook recording of Caroline Knapp‘s Pack of Two: The Intricate Bond Between People and Dogs was released at Audible.com. In 2013, she starred in the television film Mary and Martha alongside Brenda Blethyn. In 2014, Swank played the lead role of Kate Parker, a woman whose life is shattered when she develops the degenerative disease ALS, in You’re Not You. The film co-starred Emmy Rossum and Josh Duhamel. In 2017, she appeared in Steven Soderbergh‘s heist comedy Logan Lucky as Special Agent Sarah Grayson, alongside Channing Tatum and Daniel Craig, and portrayed lawyer Colette Hughes in Bille August‘s drama film 55 Steps. Swank will star in and executive produce the Alzheimer’s disease drama film What They Had, directed by Elizabeth Chomko. She has been cast in two upcoming television projects; she will portray Gail Getty in the first season of FX‘s anthology series Trust, and will star as Laura Murphy in Alejandro Gonzlez Irritu‘s drama series The One Percent. On March 22, 2016, Swank announced her engagement to Ruben Torres, a financial advisor with UBS and former professional tennis player. The two had been dating since May 2015. In June 2016, Swank’s representative confirmed she and Torres had ended their engagement. In October 2011, Swank attracted controversy for attending an event in Chechnya‘s capital Grozny on the 35th birthday of Chechen president Ramzan Kadyrov on October 5. After wishing him “Happy birthday, Mr. President”, she reportedly claimed knowledge about Kadyrov saying, “I read. I do my research.” Following criticism from human rights groups, that reported having informed her about the human rights abuses in Chechnya prior to the event and asked her to reconsider her participation, Swank said she was unaware that Kadyrov had been accused of human rights violations and that she “deeply regrets” taking part in the lavish concert. She donated her personal appearance fees “to various charitable organizations”.